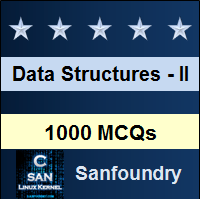 This set of Data Structures & Algorithms Multiple Choice Questions & Answers (MCQs) focuses on “Shell Sort – 2”. Explanation: Shell sort is also known as diminishing increment sort since each pass is defined by an increment h such that only the records which are h units apart will be sorted. 2. Statement 1: Shell sort is a stable sorting algorithm. Statement 2: Shell sort is an in-place sorting algorithm. Explanation: In Shell sort, the relative order of elements with equal values may change. Therefore, it is not a stable sorting algorithm. Shell sort is an in-place sorting algorithm as it requires O(1) auxiliary space. So, the sequence after first iteration will be, 27 59 39 37 15 90 81 49. 4. Consider the following code snippet, which implements the Shell sort algorithm. Which condition will correctly implement the while loop? Explanation: In Shell sort, for increment = h we sort the sub-arrays that start at arbitrary element and include every hth element. Therefore, the condition given in option k >= span && y < elements[k- span] will implement while loop correctly. Explanation: Shell sort is an improvement on insertion sort that allows the exchange of elements that are far apart. Shell sort algorithm sorts separate sub-arrays of the original input array. These sub-arrays contains every hth element of the original array. Explanation: An array that is 7-sorted, becomes 7-ordered. And an array that is 5-sorted, becomes 5-ordered. If k-ordered array is h-sorted, it remains k-ordered. Thus, an array that is first 7-sorted, then 5-sorted becomes both 7-ordered and 5-ordered. Explanation: The best case occurs when the array is already sorted. In best case the number of comparison for each of the increments-based insertion sorts is equal to length of array. Here 2k –1 < n, where n is the number of records. So k < log(n+1), thus the sorting time in best case is less the n * log(n+1). Therefore best case time complexity is O(nlogn). Explanation: Records are h-ordered if every hth element (starting anywhere) yields a sorted array. Therefore, given records with keys K1, K2, K3,.. KN are said to be h-ordered, if Ki <= Ki+h for 1<= i <= N-h.
9. Shell sort is more efficient than insertion sort if the length of input arrays is small. Explanation: Insertion sort is more efficient than Shell sort if the length of array is small because insertion sort is quite simple to program and involve very few actions other than comparisons and replacements on each pass. Explanation: Both Shell sort and Comb sort have repeated sorting passes with decreasing gaps. Unlike Comb sort, in Shell sort the array is sorted completely in each pass before going on to the next-smallest gap.